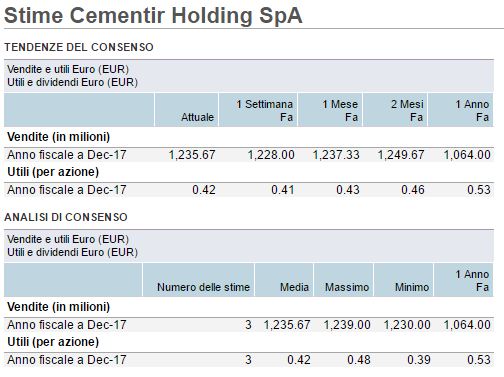 Inside The Market: Cementir Holding S.p.A. : the new acquisitions boost the business. 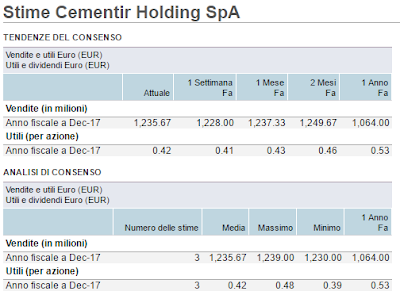 Cementir Holding S.p.A. : the new acquisitions boost the business. The last uptrend of the stock is due primarily to the preliminary consolidated results at 31 December 2016 : results over the expectations of the analysts. 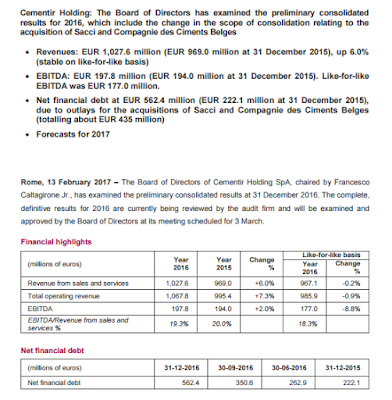 The good results are related to the new acquisitions of Sacci and Compagnie des Ciments Belges that worsened the net financial debt. On like-to-like basis, the results would have been stable or decreasing. From this point of view, the growth through acquisitions is a focus for the business. According to me, it will be the likely growth engine for the coming years. History is there to prove it. 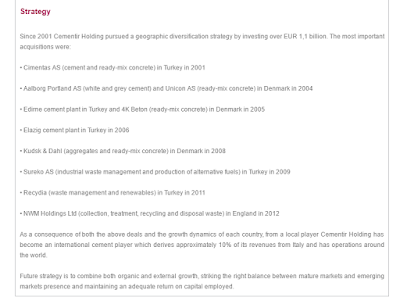 The strategy is always the same : organic and external growth thanks to the numerous acquisitions over the years, with a low dependence on the domestic market (about 10% of the revenues). See the image below. 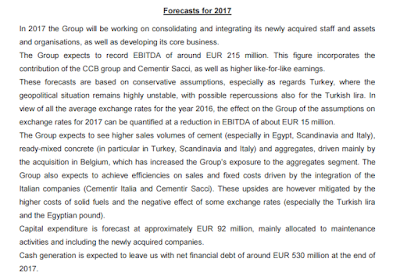 The outlook is substantially conservative, EBITDA of around 215 EUR million. 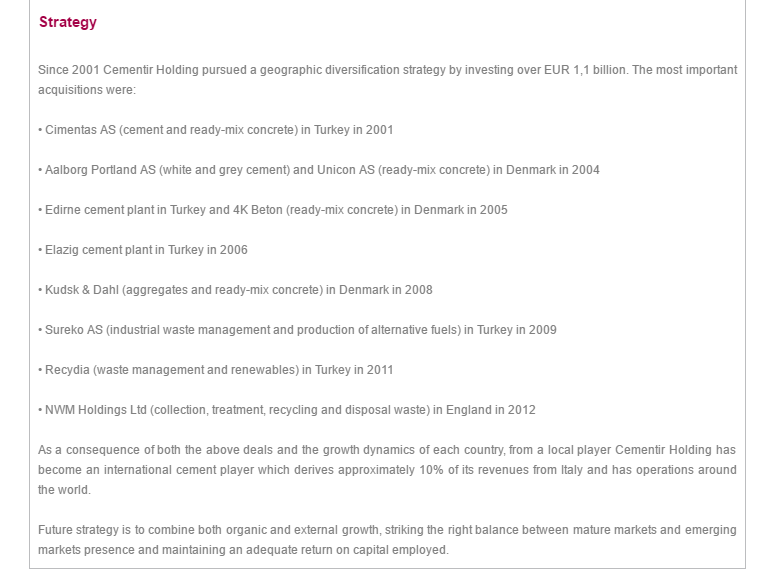 The business is still suffering unfavorable FX and geopolitical troubles (Turkey). However, the management is well set to make the difference with a cost saving policy and with the strong implementation of the integration just closed (Sacci and CCB). About the fundamentals, the price is pretty interesting although the expectations could be flat/conservative (mainly, about the margins). 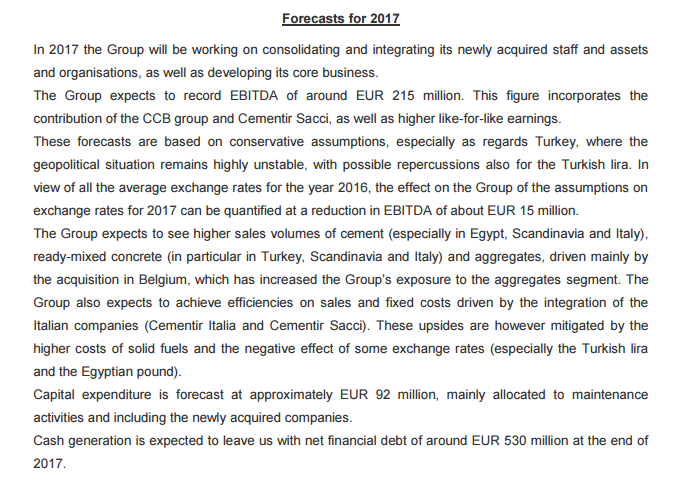 With the 2017 expected results : P/S 0.65 X ; EV/SALES 1.07 X ; EV/EBITDA 6.20 X ; P/E 12 X ; P/B 0.7 X. About the chart, the downtrend from 7 EUR/share is over. For some time today there is a lateral trend but the last performance with volumes is a good signal that could invalidate the trading range (3.30-5.05). It needs a continuation with the break of area 5/5.30 (FIBO level 38.2%). In the meantime, the uptrend is too strong in a short time : about +30% with five trading sessions. The volatility is high (in the high range of the BB), RSI is overbought, there is a gap down to cover. There will be a physiological price correction, probably.